A few months ago (… November) for Meatless Monday I posted a recipe for Vegetarian Curry which is an ideal vegetarian dish. It’s easy to make, hearty, comforting and easy. Since I’m a person who likes to do as much as I can from scratch, when it came to making curry I knew it would be no different. It’s easy to pick up a jar of curry powder at the grocery store, but if you have the basic spices, making your own is just as simple. Store this curry powder in your spice cabinet, maybe right next to your Basic Spice Rub. For tonight’s Meatless Monday why not whip up a batch of Vegetarian Curry with homemade curry powder. Combine ingredients and store in a glass or plastic container. Use in recipes whenever they call for curry powder. I really need to make a batch of this. As a vegetarian, I am constantly rummaging around in my spices to see what I can find when I need it (and if I am hungry I am not patient). 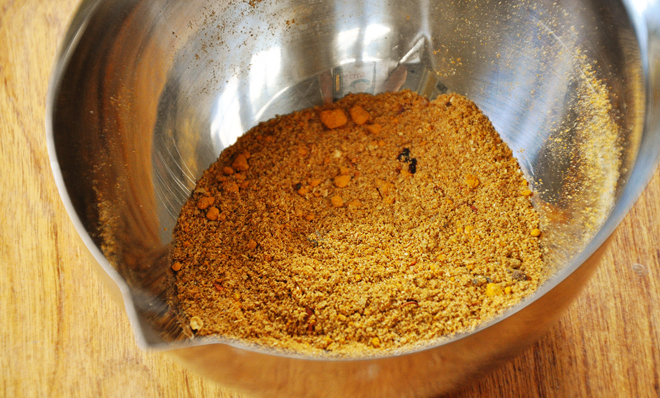 It would be so nice to have a homemade curry powder on hand!